Please note: Bayfield Festival of Song is not presenting a season in 2013 — this post is archival information only. 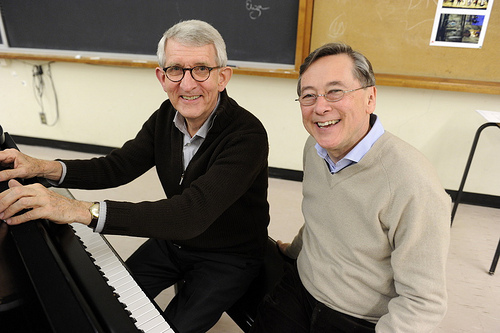 The Bayfield Festival of Song is a wonderful experience, even if you’re just dipping your toe in the water of live classical music – piano and song. As a newcomer to classical song, Cindy’s attendance at her first opera was in New York City (in the 70’s!) with a family friend who adored opera – she discovered that sharing someone’s passion for opera is the best way to experience the drama and amazing music. Her first Bayfield Festival of Song experience a few years ago felt the same way – seeing Bruce and Stephen share their passion with the audience and the performers is so accessible and welcoming to everyone. The June setting, the songs and the sense of pleasure all make for a special personal treat. The intimate Bayfield Hall is a friendly spot filled with people expecting to be well entertained by eager professionals who are passionate. Our expectations are met and exceeded each year we’ve attended the performances. So go ahead and join the audience. You’ll be joining the standing ovations too! The Festival runs from June 2 to 10, 2012. Canada’s leading operatic soprano, Adrianne Pieczonka, will sing on Friday evening, June 8; she will be singing a dazzling, varied programme with her partner, the fine mezzo-soprano Laura Tucker. On Thursday afternoon, June 7, a group of young singing students will have the tremendous experience of being coached by Adrianne in a master class, which is also open to the public. On Saturday, June 2. Upstairs/Downstairs will take a journey from 1900 through the Great War and into the Roaring Twenties, contrasting the art-songs and ballads performed in an English drawing-room with the rollicking entertainment of music-hall and ragtime which found favour below stairs. On Saturday, June 9, baritone Alexander Dobson performs in Recital. This versatile young baritone has appeared in operatic roles ranging from Wozzeck and Marcello in La bohème to Don Giovanni and Papageno. Experience the Saturday morning Coffee Concerts, and also a special programme in honour of the Royal Jubilee. On each Sunday afternoon, June 3 and June 10, four exceptionally talented young singers will perform Diamonds for a Queen, celebrating sixty years of the present reign, soon to rival Queen Victoria’s in length.